Business Insider/Stefano PozzebonPaul Priestman, the designer of the new Tube for London, says his model will have to work, and be fit, for as long as 2060. London needs new underground trains. Some of the existing ones are decades old. 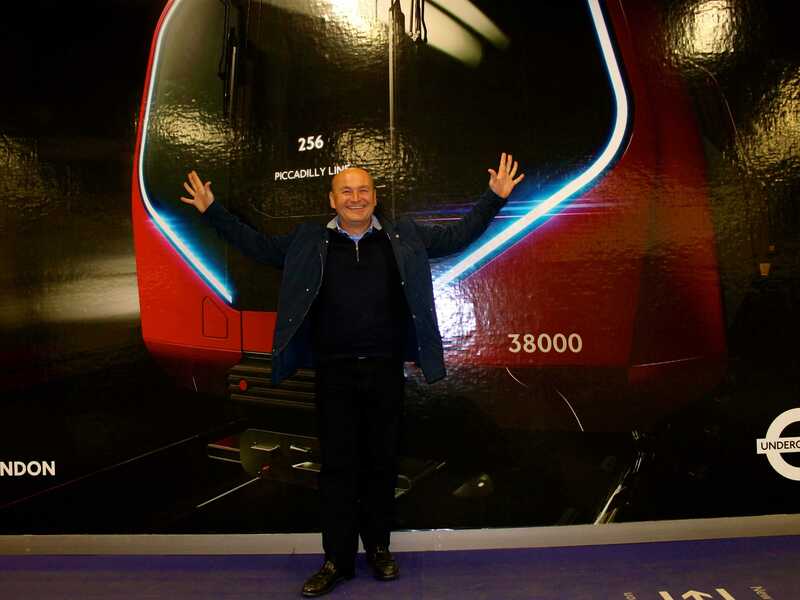 That task has been handed to Paul Priestman, director of design firm PriestmanGoode, which partnered with Transport for London (TfL) to develop the New Tube for London. The modernized fleet, featuring wider doors, air-cooled carriages, and digital screens with live updates, will hit the Piccadilly, Bakerloo, Central, and Waterloo & City lines within the decade. The plans for the multi-billion investment were unveiled in early October and are on exhibit at King’s Cross until Nov. 16. Priestman, a Royal College of Arts graduate who is also behind designs for the Gatwick shuttle and Virgin’s Pendolino train, spent about three years coming up with the final design, with help from his four assistants and a team of TfL’s own engineers. The challenges were monumental. Almost 4 million people currently take the Tube everyday, a number that is expected to grow as the population of London continues to increase. In 2022, when TfL predicts the new trains will be ready, London’s population is projected to hit 9 million, according to the Office of National Statistics. But the underground network is already at its maximum capacity. Right now, the TfL can simultaneously operate up to 535 trains, so the designers had to come up with a plan to increase the number of convoys on the move at the same time. They did this by reducing the time that each trains stops at the station. Wider doors means means it will take less time for people to load themselves into the cars. Business Insider/Stefano PozzebonThe new trains will have wider doors, reducing the amount of time the train stops in a station. The new cars will have a longer lifespan than the current rolling stock. Priestman tells Business Insider that he expects the new trains to be in good shape and functioning 50 years from now. The oldest trains in operation today are from the early 1970s. Business Insider visited the new Tube exhibition at King’s Cross and spoke to Paul Priestman about his latest project. PriestmanGoodePriestmanGoode’s design for the New Tube for London will take the city into the future. Business Insider: How did you go about increasing transport capacity and improving the quality of travel, given obvious limitations? Paul Priestman: We had to take every available space back for the passengers. You can’t change the size of the train, because the tunnels are there, and you can’t change their length, because they are based on the platform, but we need more space. We did it through full trains — there will not be a door-break between one car and the other, but a flexible concertina where people can stand. The number of seats was fixed, but we increased space for the standing passenger. BI: What were the other challenges? PP: We had to find a way to put more trains on the network, but in order to do that, you need to cut the time the train stays in the station. It’s called dwell time, the time when the system is at stall. Getting people on and off the train more quickly will be the true breakthrough. We increased the number and the size of the doors, and more spacious trains mean that people will slide through more quickly. The doors will be colour coded, like traffic lights, to give people more information to get on and off. Other info will be available on the floor, designed to let the passengers flow toward the centre of the car, and on the electronic screens, that will run commercials through the journey, and display useful information on approaching station. BI: I’ve heard that new trains will be cooled. Is that true? PP: That was a requirement, and hopefully they will also be less smelly, as the trains will be easier to clean. We do a lot of aircraft design and hotel internal design, and all the materials we use in that area we tried to use it here on these trains — very durable but looks more luxurious. TfLEvery colour used in the New Tube represents a unique aspect of London. BI: What new materials are used in the new Tube? 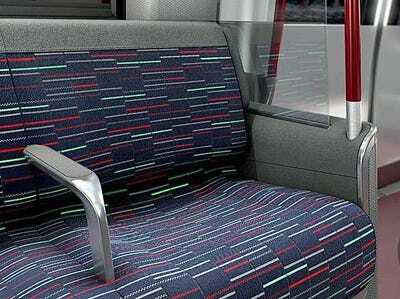 PP: For example, the London Tube is one of the few in the world that allows us to use fabric seats. You could not do that in New York, it would get vandalised. But in London, you can and I think that it is comfortable. Other materials, and colours, are reminders of what we see in this city: there is the black of iron and railways, and the red of the bricks. Glass and stainless steel represent Canary Wharf, the City, and its skyscrapers. There is the green of the rain reflection in a misty day. I call it “Londonness” — this train will be the new face of London, and will last. PP: I don’t like the word heritage; it is not something from the past. I think this Tube express is what London is now and what is going to be for the next few decades. BI: Will we see this train on the other lines, like the Hammersmith & City? PP: No, those other lines use other trains, because the tunnels are different. So there will be different project, but I think that the direction of the design has been set. BI: You travel a lot for your work and have designed projects throughout the world. How do you rank the London Tube among the other public networks? PP: I think that the integrated system in London is just great. There is no excuse for having a car here: when I commute, I can take the bus, Tube, overground, Boris bikes [London’s bike sharing network, a pet project of mayor Boris Johnson], and there is car sharing. And everyone uses it here. It is not like in America, where if you are pretty well off you would not take the bus. This also because London is really compact, and that is why I love it. Another thing I like is the brand behind it. I was in China a few weeks ago and I saw a girl wearing a T-shirt with the TfL symbol of it. That is a symbol of London. How many other public transport networks can claim the same? PriestmanGoodeThe New Tube will feature digital screens. BI: The new Tube, which is said to be driverless, has already upset the tube workers’ union. What do you think about it? PP: It was part of the designer brief — it’s possible for these trains to go driverless. If and when, it is not our decision, but they are ready for this eventually. I don’t want to enter the issue, but it is a fact that it already happens in many other systems around the world — and in the DLR here — it is just a way to prepare for the future. PP: That is true. I suppose it is something like the tunnels: They have always been there with that size, and it is hard to change it. So with the drivers, they have always been there. BI: Of all the projects you have done, which one made you the most proud? PP: I always look at the future, and I am always into the latest project, which is unfortunate because I can never comment on it. For example now, we are looking at some big train for some European countries. It is fascinating. There is nothing like transport design because it has to grasp the taste of that place. I don’t like to wake up in an anonymous hotel room, or travel in a tasteless plane. If I am in China I want my hotel to let me breath that I am in China. It is a backlash to internationalism, and I love to do that. BI: What were the images you had in mind when drafting these trains? Someone joked about Darth Vader, or other sci-fi references. PP: [Laughs] No, nothing like that. I had London in my mind. These trains will be the new symbol of London People may not remember Darth Vader in 20 years time, or in 30. Maybe yes, I don’t know. But I had to think that far ahead.